A mediator from the state’s labor board met for the first time yesterday with negotiators from LA Unified and the teachers union, UTLA, to move contract negotiations forward. But the result was a gulf between the sides that remains wide as ever. “At this time, the union’s economic demands remain $774 million dollars higher than the District’s offer,” LA Unified’s chief negotiator, Vivian Ekchian, said in a statement. Also at issue is the fate of $171 million in federal revenue from a California Office to Reform Education (CORE) Waiver, which requires that the two sides agree on a teacher evaluation system by March 31 that includes a minimum of three rankings. Without an agreement with UTLA, the district may be disqualified from receiving the money. “The funds will be used to pay teachers to provide summer school instruction, after-school tutoring programs and other intervention services to students for the next three years. The union has not yet agreed to this proposal, leaving at-risk these vital school-site services to students,” Ekchian said. ULTA has not yet issued any pubic statement about yesterday’s meeting and did not respond to a request for comment. Yesterday’s meeting was the first of three legally mandated sessions with the mediator from the Public Employee Relations Board. The next two are scheduled for April 6 and April 15. They could be extended, and only the mediator can determine that the two sides are unable to reach a resolution. 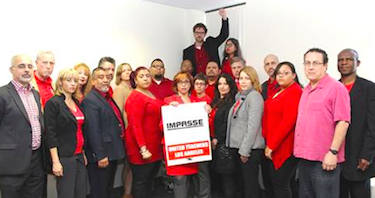 Before an impasse was declared on Feb. 17, negotiations between the district and UTLA dragged on for seven months. While both sides have given ground, they still remain far apart on such key issues as teacher salary and class size. The district’s last offer before the impasse was for a 5 percent raise. UTLA, which hasn’t received a raise for its teachers in over seven years, is asking for 8.5 percent, along with an agreement that the district will make major reductions in class size and hire thousands more school counselors, nurses and librarians. At stake is nothing less than a full strike of UTLA’s 35,000 educators, which the union has been threatening to do as it has carried out a series of “escalating actions” over the last six months. Those efforts included a rally at Grand Park that was attended by thousands, and the recent boycott of faculty meetings.